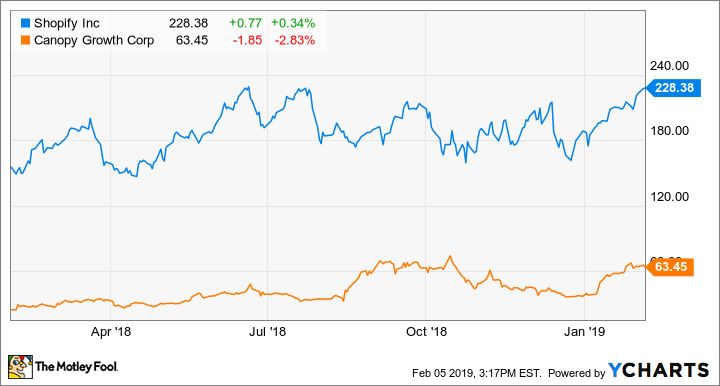 The Motley Fool Canada » Investing » Shopify (TSX:SHOP) and Canopy Growth (TSX:WEED) May Be Trendy, but Which Is the Better Investment? Shopify (TSX:SHOP) and Canopy Growth (TSX:WEED) May Be Trendy, but Which Is the Better Investment? With markets finally on the rebound, there are two stocks that investors have seen pop up again and again: Canopy Growth (TSX:WEED)(NYSE:CGC) and Shopify (TSX:SHOP)(NYSE:SHOP). It can’t be denied; the two stocks have had a huge rally. Canopy Growth dropped to the $30 range after reaching highs of $75 per share. Shopify has been just as exciting, with the stock dipping down to around $160 before bumping back up to prices above $225 — a share price not seen since July of last year. That’s all well and good, but as we’ve learned in the last six months, a lot can happen in a volatile market. And we’re not out of the woods yet. So, which stock has the long-term potential? The marijuana industry has been bumped back up lately from two major pieces of news: Aphria’s positive quarterly earnings report at the beginning of the year and the passing of the Farm Bill in the U.S., legalizing the production and selling of hemp — cannabis without the psychoactive component. While the news bolstered Canopy Growth, it’s jumped from other announcements as well. For one, the company’s medically focused business Spectrum Cannabis continues to grow its cannabis production and distribution network throughout the United Kingdom and Europe. Also, CIBC named the company a “global titan” of the marijuana industry, set to be the top dog when the dust settles. The company has also been expanding throughout the U.S., in part from its partnership with Constellation Brands. The beverage company is one of the largest distributors of beer in the world and provides Canopy Growth with a vast distribution network. Should marijuana become completely legal through the U.S., Canopy Growth will be in a primo spot. Now, Shopify is exciting in a completely different way. Like Canopy Growth, it has become a titan of its own tech-based industry, setting itself up for further expansion of its e-commerce platform. Whereas right now the company makes most of its money through subscription services, in the near future analysts predict its merchant solutions will outpace that growth over the next decade. That’s right: decade. Shopify is here for the long haul and is making plans to prove it. The company is far ahead of any of its competitors, if you can call them that. As one Fool writer noted, Shopify is moving towards Augmented Reality stores, where customers could see 3D renderings of their product before purchasing, and ask an Artificial Intelligence presence any questions they might have. You don’t see competitors anywhere near this type of innovative tech. That may seem like a lot to work up to, but it’s not like investors will have to wait around for more news to bolster shares. The company recently announced it would be opening a TV and film content development and production house called Shopify Studios to produce entrepreneur-focused documentaries. It also has an edge on the marijuana industry, becoming the platform of choice for processing cannabis sales from B.C., Newfoundland and Labrador, Ontario, and P.E.I. These stocks are both great buys, and if you have them already definitely hold onto them. But if I’m going with one today, it has to be Shopify. The stock has strong financial health, with $1.5 billion in cash and short-term investments, and consistently puts out strong earnings reports. Most recently, it generated revenue of $270.1 million for third quarter, and analysts expect more great results for the next quarter. From where I’m standing, it’s only the beginning for this strong stock. Again, it’s not that Canopy Growth is a bad stock, it’s just part of a bubble industry at the moment. Until the other smaller companies fall away and it comes out on top, I would be wary of investing in such a volatile stock at a premium price. Fool contributor Amy Legate-Wolfe owns shares of Canopy Growth and Shopify. Tom Gardner owns shares of Shopify. The Motley Fool owns shares of Shopify and Shopify. Shopify is a recommendation of Stock Advisor Canada.